Fruit representing 21 of 1,600 Malus sieversii trees growing in Geneva, New York. The trees, grown from germplasm collected in central Asia, contain a treasure trove of genes for improving disease resistance of American domestic apples. Horticulturist Phil Forsline steps from his pickup truck on a cool spring morning, mulling where to start his day’s work. “Let’s see, that’s Kazakhstan over to the right,” he says. “To the left, that’s China. Though said tongue-in-cheek, it’s still a sweeping statement. After all, thousands of miles separate the Kazak nation, which spreads away from the Caspian Sea’s northeastern shores, and Sichuan, the Chinese province near the Himalayas that Forsline is referring to. In actuality, Forsline stands on a dirt road bisecting apple orchards north of the Finger Lakes community of Geneva, New York. But the studies he and colleagues are bringing to a climax bridge not only far-apart Asian regions, but places in time as well. Forsline is curator of ARS’s Plant Genetic Resources Unit (PGRU), located on Cornell University’s Geneva campus. And the genetic makeup of the trees he attends to may revolutionize the nation’s—and perhaps the world’s—apple industry. These trees come from seeds and grafts Forsline and other researchers collected mostly during the 1990s in central Asia and Europe. Their material was gathered during seven expeditions sponsored by USDA and the U.S. National Plant Germplasm System aimed at expanding the known genetic diversity of apples. Back in his office, Forsline explains that central Asia—Kazakhstan and Kyrgyzstan in particular—is likely the ancestral home of familiar domestic apples (Malus x domestica) such as Red Delicious, Golden Delicious, and McIntosh. “We tapped millions of years of adaptations to improve today’s apple,” he says. Forsline went on seven of the trips, including four to central Asia, to collect apple material, conserve it, and, after evaluation, distribute it to breeders and geneticists worldwide. Other trips were to Sichuan, Russian, and Turkish sectors of the Caucasus region, and Germany. He recalls the expeditions as hard work. Often, the only way of getting to remote mountain areas was by helicopter, long hikes, or half-day-long jeep rides down bumpy, dusty roads. 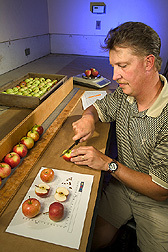 Technician Greg Noden characterizes morphological traits of M. sieversii fruit and cuts the fruit in preparation for taking a digital image for the website www.ars-grin.gov/gen. In all, the scientists returned from central Asia with 949 apple tree accessions. Most of the specimens were brought here as seed, but 50 were cataloged as “elite clones”—grafts of the original trees. 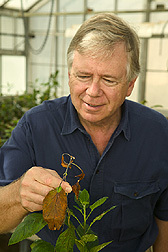 Herb Aldwinckle, plant pathologist from Cornell University, observes a susceptible seedling of M. sieversii inoculated with the bacterium (Erwinia amylovora) that causes fire blight. The curator and colleagues from PGRU and other institutions—the main collaborators include ARS plant geneticist Gennaro Fazio and Cornell University plant pathologist Herb Aldwinkle—are paying particular attention to the trees’ germplasm and rootstocks. “Germplasm” refers to the genetic material that carries the inherited characteristics of an organism. “Rootstocks” are plants with desirable root traits that are used as support root systems for fruiting cultivar grafts. A grafted tree produced in Geneva, New York, from a scion taken from a tree in a Kazakh apple forest. 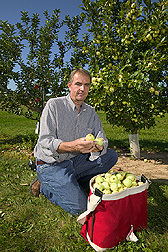 William Srmack, farm manager at Geneva, displays the quality fruit of this genotype that has potential use by breeders. In addition, he led a project in which the popular Gala apple variety was crossbred with seven Kazak accessions. “This produced 7 populations of 250 seedlings each,” he says. “In one of these populations, we achieved a 67-percent resistance rate against apple scab. Forsline says this study, which involved scientists from Cornell and the University of Minnesota, as well as collaborators from New Zealand and South Africa, “may be the source of a more durable, scab-resistant apple. “Also, about 30 percent of samples inoculated with fire blight resisted that disease,” he adds. Fire blight destroys apples, pears, and woody ornamentals in the Rosaceae family. Technician Todd Holleran waters young apple rootstock seedlings that have survived the “gauntlet” of disease screens. These disease-resistant seedlings are derived from a cross between resistant wild M. sieversii selections and elite apple rootstocks from the Geneva breeding program. And researchers have found genes in these apples that allow them to adapt to mountainous, near-desert, and cold and dry regions. Samples from species collected in other expedition sites have provided promising news in the fight against fire blight. Aldwinckle reports that seedlings from different populations of M. orientalis from the Russian Caucasus and Sichuan regions effectively resisted the disease, with Russian accessions scoring 50- to 93-percent resistance. Walking through greenhouses at Geneva devoted to rootstock studies, Fazio says that natural selection that occurs in the central Asian forests seems to have helped the Kazak trees develop resistance to soil pathogens that can otherwise stunt young apple orchards and lead to poor growth and lost production. He says this material is “a treasure trove” of new genetic variants for resistance to Phytophthora cactorum, which causes collar rot, and Rhizoctonia solani, an agent of apple replant disease. Fazio sent rootstock samples to plant pathologist Mark Mazzola of ARS’s Tree Fruit Research Laboratory in Wenatchee, Washington. Mazzola, who specializes in soilborne diseases of apples, tested it for resistance to R. solani and found it to be significantly more resistant than all the controls he was using. He says a goal now is to release germplasm lines from the collected materials within 5 years. “These collections are now being offered to breeders to develop diverse and useful hybrids for fruit, ornamental, and rootstock value.”—By Luis Pons, Agricultural Research Service Information Staff. This research is part of Plant, Microbial, and Insect Genetic Research, Genomics, and Genetic Improvement, an ARS National Program (#301) described on the World Wide Web at www.nps.ars.usda.gov. 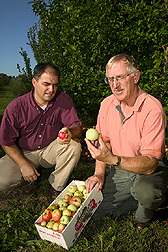 Philip L. Forsline and Gennaro Fazio are in the USDA-ARS Plant Genetic Resources Unit, Cornell University, Collier Dr., Geneva, NY 14456; phone (315) 787-2390 [Forsline], (315) 787-2480 [Fazio]; fax (315) 787-2339 [Forsline], (315) 787-2216 [Fazio]. 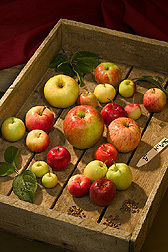 "Remarkable Kazak Apples" was published in the January 2006 issue of Agricultural Research magazine.